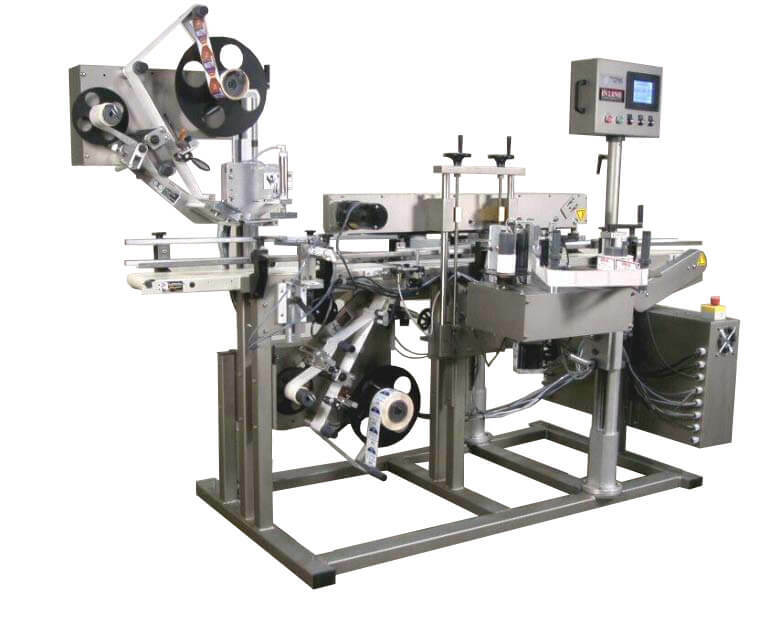 Model 2000NW Labeler | InLine Packaging Systems, Inc.
Incoming round containers are spaced using a single powered feed screw. Non-round containers require dual feed screws. The timing screws define the spacing and any special orientation as required, centering the containers under a top hold-down belt which secures the containers through the label application and wipe. The conveyor is driven by a variable speed motor. The top hold-down belt and the timing screw are electronically controlled to match the speed of the conveyor. As the speed of the conveyor changes, they automatically adjust and “follow” without having any mechanical linkage to wear or break. The label stations are powered by servo motors, which are known for their tremendous accuracy and torque characteristics. They have accuracy within a few thousandths of an inch, and when used in conjunction with our machine, produce outstanding label accuracy within +/- 1/32”. The entire machine is controlled by a Motion Controller and supplied with an LCD Touchscreen operator interface that is truly user friendly. The Touchscreen allows the operator to increase/decrease the speed of the overall machine, turn on/off each label station, as well as adjust the timing of the dispensing of the front and rear labels. The rated speed of the machine is 2000 ipm of label feed, which should allow 300 bpm for an average application. Our control package also includes our “Autoset” function, which is the ability of the machine to “self-teach” new packages. The bottle width and label length are measured so settings and measurements can be edited and saved for future use. Gaps between the labels are sensed using standard Folk sensor through-beam photo-eye for standard paper or film labels. Labels on non-round containers are wiped by a brush mechanism or sponge rubber roll. The Label stations handle labels up to 6” from the base of the container and the machine handles tapers from -9 degrees to +9 degrees on the side wall of the container. The optional wiping wrap belt and back rubber plate for round containers are mounted to the machine on sliding brackets. When labeling round containers, the brushes are moved away, the wiping belt and back rubber plate are moved into position, and then labels loaded only on the one side. The wiping station has its own separate DC motor and speed control to adjust wiping speed independently of the conveyor. This motor can be turned off independently of the machine when not in use. Our Model 2000NW Labeler is a powerful machine. Combining versatile function with insane accuracy, this labeler means business. 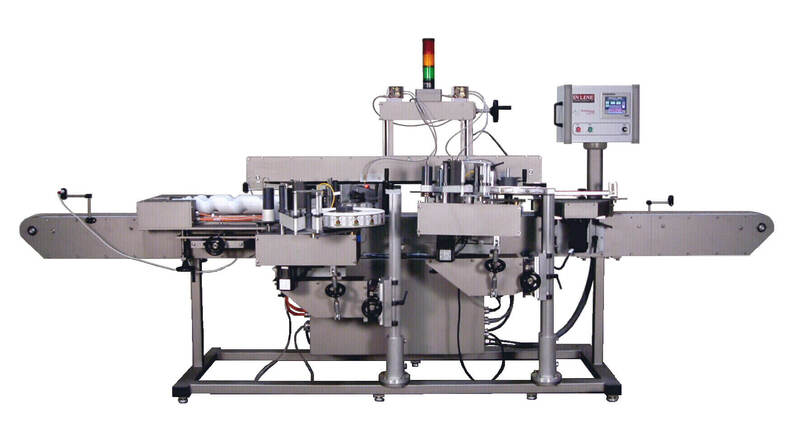 Provide the speed, efficiency, and precision that your bottling production deserves with our Model 2000NW Labeler. All In-Line machines are backed with a one-year warranty, and we are available to answer questions and troubleshoot. We don’t leave you cold after the purchase. We develop a relationship with our customers and are here to help them as their business grows and changes. So, you can be confident when you partner with In-Line that you are receiving not only quality products, but quality service as well.